Living here in California has many advantages, one of my favorites being the abundance of fresh avocados available to you practically year round. If you think you know avocados and haven’t had an organic one from a local California farmer, well then you just don’t know. Before, I would grill them with just a little olive oil and lemon juice all the time for a snack. Ever since I had them cold and marinated this recipe has become my go-to. Try it for an easy, guilt-free snack. Mix the oil and soy sauce together in a small dish. Peel avocado and place both sides next to each other in a bowl. Slice. Equally spread the tops with the lemon juice. Then pour the olive oil/soy mixture on each. Coarsely grind some black pepper or the top. Cover & refrigerate for 12-24 hours then enjoy. 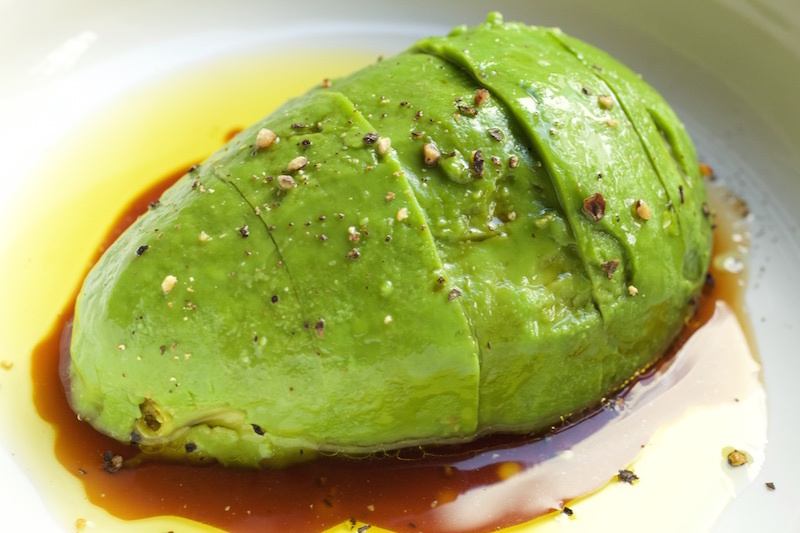 Avocado doesn’t actually have much protein at all. Tons of healthy fats though. Looks delicious. Thanks for pointing that out! You are right, it is a high-protein fruit, but not necessarily a high-protein food.